Now that the copyright-flogging, spam-blogging leeches of the Internet have officially entered the cocktail-blog realm — and my apologies for being cryptic, but if you have no idea what I’m talking about, you’re one of the lucky ones — I thought I should follow suit and start stealing from myself. Here’s a drink I posted last Friday over at NBA Betting OddsSerious Eats that’s worthy of a little more exploration. I was introduced to the Northern Spy a few weeks ago by Murray Stenson, who mixed one for me while I was in my customary clueless mode about what to drink next. The recipe sounded familiar — apple cider, applejack, lemon juice, liqueur (more on that in a minute) — and after refreshing my memory with the help of my good friend Google, I realized that Erik had recently posted the recipe on eGullet as part of his Stompin’ Through the Savoy journey, while mixing up some cocktails with San Francisco bartender Josey Packard at Alembic. I had the good fortune to meet Josey last month while in San Francisco, and while I had only one drink at Alembic — the fault for which I lay on the residual Bourbon & Branch-induced hangover I was traveling with at the time — it was obvious that Josey knew her stuff. The Northern Spy just drives that point home: perfectly suited for late autumn and early winter, this drink is a match made for Thanksgiving. Josey says she serves this at her own family gatherings, and I’ll be putting together a round or two on Thursday, partially to enjoy the drink’s rich flavor but also to play with a few variations. Josey’s recipe calls for using apricot brandy for flavor and sweetness (she even makes her own, macerating a pound of dried apricots in 750ml of VS or better brandy for a few days). I’ve used a couple of the better commercial versions out there — Rothman & Winter Orchard Apricot and Giffard Abricot du Roussillon — with fantastic results. She also says the Northern Spy works great with the royale treatment — topping the cocktail with an ounce or so of chilled champagne — which I’m definitely going to have to try this week. But during my first introduction to the drink at Zig Zag, Murray pulled out a bottle of house-made pimento dram and used that in place of the apricot brandy; this swapped the elegant fruitiness of the drink for a deep, mellow allspice tone that really emphasized the Northern Spy’s autumnal character. Then tonight, just for laughs, I broke out the bottle of Giffard Ginger of the Indies liqueur and substituted that for the apricot, giving the drink an aura of spicy brightness. Josey’s got a great drink here, whether made her original way with the apricot or with the allspice or ginger variations. 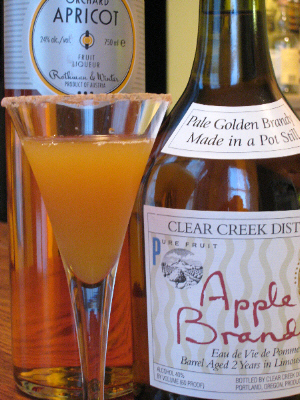 If you’re looking for a Thanksgiving drink — or holiday cocktail, or just regular autumn tipple — the Northern Spy is a good one to roll out. I hear you about the leeches!! I’m thinking about doing the same thing in order to help fill up my posts. I figured that you and Jeffrey and Anita et al wouldn’t mind…..
We’ve noticed spam-comments bouncing off our deflector shields at NABC HQ, so far. But were you also referring to sales entities scrapping content? Please devote an entire blog entry to the varied alchemy of Steve McCarthy. As a Northwesterner, he deserves our attention as a maestro of the fire water. Its a shame that it takes people clear across the globe to recognize what we have in our own back yard. Oh boy – very yummy! OTOH, I didn’t have any apricot brandy at hand, so I used a bit of the only fruity spirit I did have, Triple Sec, instead. It made a nice, well balanced drink, though I’ll bet it’s way better with the original ingrediennnnt list intact. I made these on Christmas day, with a small modification due to not being able to get apricot brandy anywhere. Luckily, Seattle area stores are all stocked up on Clear Creek’s Douglas Fir eau de vie, which gave put a serious yuletide spin on the drink. Really delicious. That eau de vie made a nice substitution for the creme de menthe in a stinger, as well.